Within the first few days of the structure of the outdoor classroom being complete, we have have been overwhelmed by reports of imagination, spontaneity and creativity from the children at Highgate Primary School. 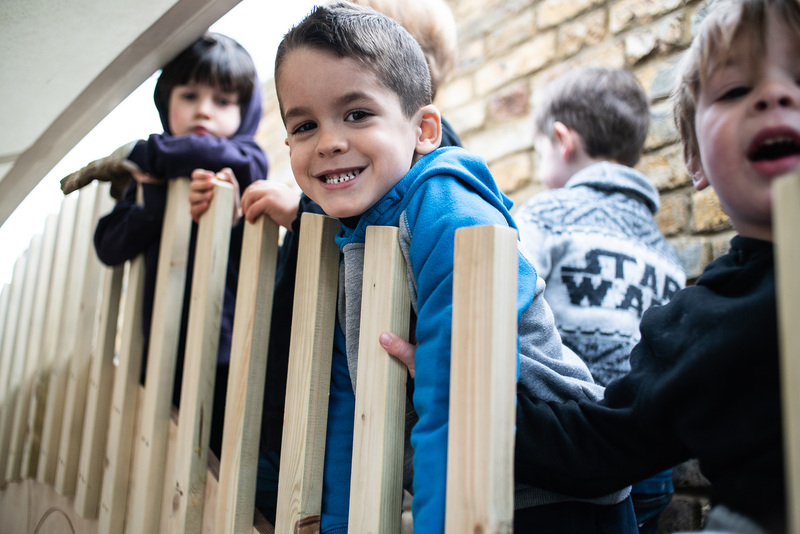 The story of the outdoor classroom began with one of the School’s 12 guiding statements: ‘At Highgate Primary, children succeed because, we care for our school buildings and grounds’. You can read more here about why the head teacher wanted to bring learning outside which would ultimately have a lasting positive impact on the children’s experiences by providing a multi-use outdoor space for formal learning as well as informal play. In September we were able to install 35 sqm larch platform and during the half term progress meant that by early November the children were able to fully utlise the space. 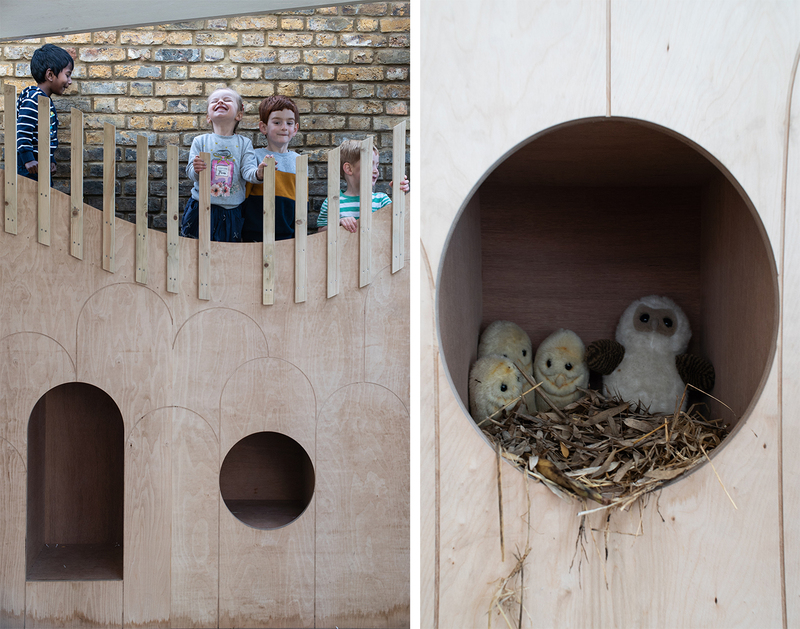 Understanding nature and wildlife are integral parts of a balanced education: last week the children created an ‘owlet nest’ in one of the nooks. The space is also being be used by the children to do activities such as arts, craft, reading, science projects, performances, storytelling and free play. The design incorporates several foam stools, when the stools are in use the spaces in which they are stored provide perfect hiding places that are too small for adults which are already being enjoyed. 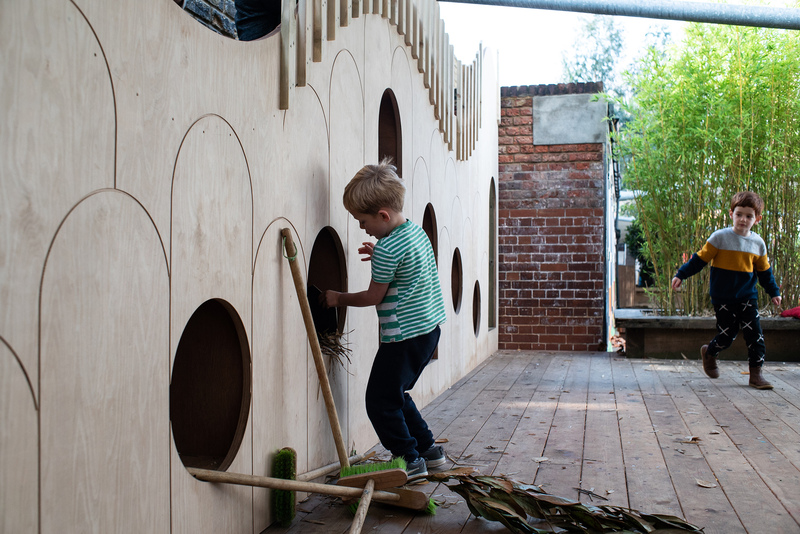 When designing places for play, we are ultimately designing for learning and development. The outdoor classroom provides independence from adults and an optimum environment in which to learn through play. The children are already enjoying the hugely positive health benefits that this outdoor learning experience will have, in terms of both cognitive and social development. 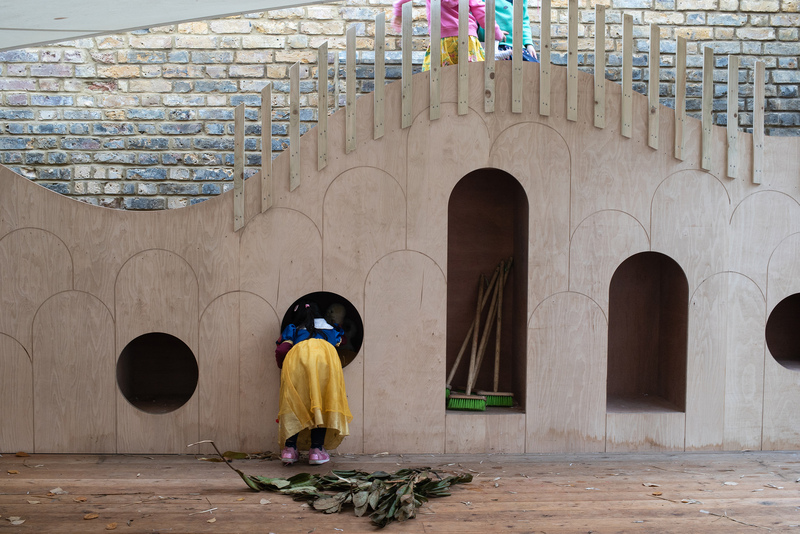 This non-prescriptive space is open to any interpretation and any use by children, teachers and parents. “Through play, children learn… about themselves, their relationships with others and the wider world… play and learning are not separate – play is part of learning and learning is part of play”. National Union of Teachers, April 2015. This statement is a testament to the future benefits of the outdoor classroom which are already evident in the first few days of the structure being complete. Collective Works has an ethos rooted in socially aware and community driven projects. Coupled with the knowledge that outdoor learning has been proven to boost development, we were compelled to find a way to support this project so we initiated a crowdfunding campaign and fundraising supper. You can read about our fundraising efforts with main partner OmVed Gardens here.